WELCOME to WEST END CRICKET CLUB! Welcome to WEST END C.C. The original "West Endians". Established at least 1877! Click here for their web page! Regular followers are aware that WECC ceased as a club at the wrap of the 2004 season: this site is not updated in the regular club sense of the word, it is however preserved here as a tribute to everyone over the years who put their valuable time and effort into running - and indeed playing for - the one and only West End Cricket Club. Click here to see just what our legendary cricketing tours were really all about! A New Year, a New Season, and a rejuvenated New Pitch! 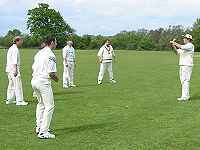 Last year saw the opening of our new wickets on a special (and hugely enjoyable) President's Day. Check out the What's New page for more additions to this site. See also: 2003 and match reports: 2002 and match reports. A Gallery of photos from 1993, the year of the inaugural tour to the Isle Of Wight. June 2002's tour to the North Cornish coast - read the report itself, plus a picture gallery, & mini-movies. Hopefully coming soon: This year's 10th Anniversary Tour. Community website (run by Chris Dovener) for everything local including West End - and us! The below info is void but indicates what we did and where we did it...! TOUR 2004 - BOOK NOW!!! Every day's a holiday. Well, it seems that way in little old Cornwall where we seem to live for five great days each Summer, allegedly on Cricket Tour! You really want to partake in this festival of enjoyment before we decide to change location! Unless otherwise notified, 2004 will be to the same c, the Ponsmere Hotel in Perranporth where all necessary amenities are close by, such as beer, pizza and burgers and a huge beach with surfing. Oh, and some cricket thrown in for good measure! The dates you need to book are FRIDAY 18th to MONDAY 22nd JUNE 2004 inclusive. Book now with Adie Barrett on 00000 - 000 000, or hit the contact button. No booking = no tour. BOOK NOW!